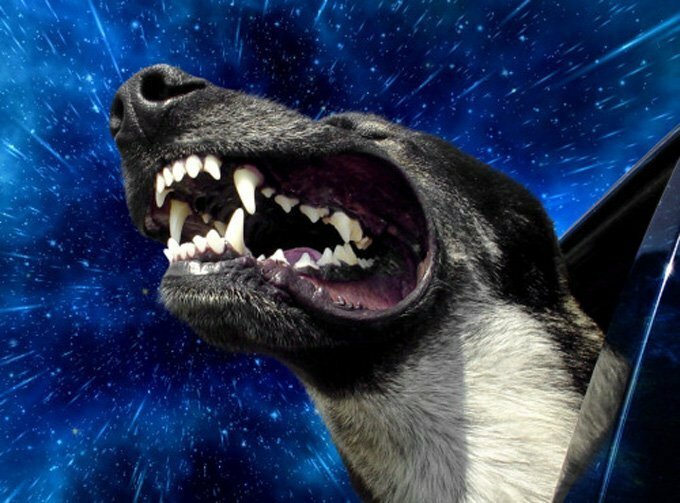 Ground control to Major Tom — one very creative artist with a good sense of humor is busy transforming regular dogs into “bone-a-fide” rocket dogs, and he managed this with only a camera lens and some really good Photoshop techniques. 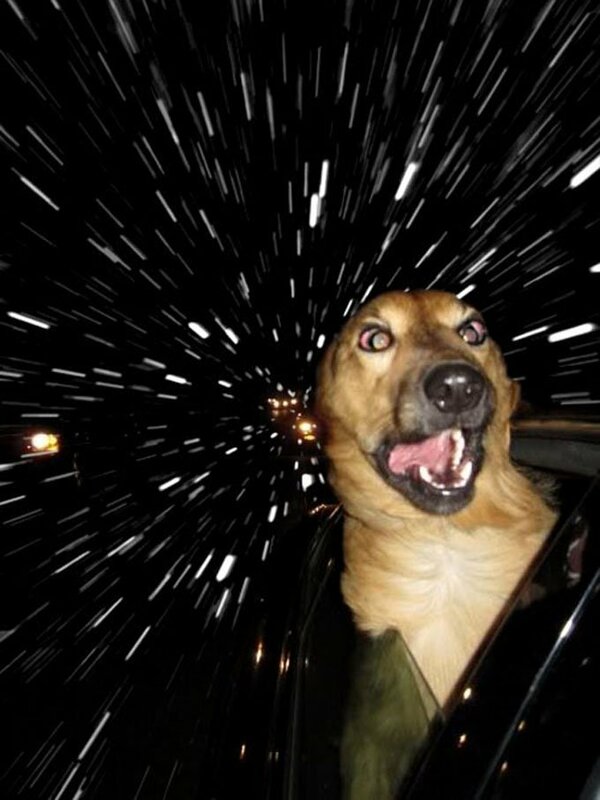 The collection of photos shows dogs of various breeds looking as if they are tearing through the galaxy faster than the speed of light, like some four-legged version of Battlestar Galactica. St. Louis, Missouri photographer and humorist Benjamin Grelle, known online simply as “The Frogman,” is the man behind these hilarious photographs. While the images might seem like they are literally out of this world, Grelle tells the Daily Mail he developed the idea while capturing dogs doing something quite ordinary. Grelle was able to create such unbelievable shots with the help of his father and a couple of willing canine participants. “I had my dad drive up and down the driveway and I took pictures as they passed,” The Frogman explains. “It often makes them look like they are going faster than they are — as if they are travelling at unimaginable speeds. I thought it only natural that they be travelling faster than light in the depths of space. From a Bulldog with his loose lips flapping in the breeze and a German Shepherd mix grimacing into the cosmos to a shaggy dog sporting Doggles and looking a heck of a lot like a windblown platinum blonde version of Chewbacca, Grelle’s photos are as trippy as they are amusing. 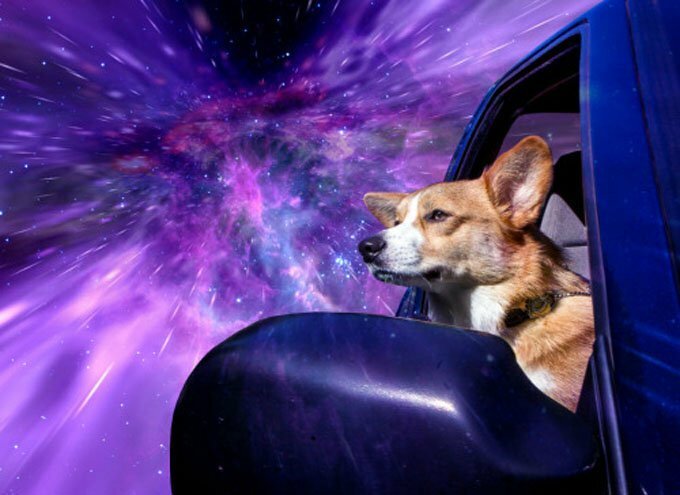 One astro-dog holds a special place in Grelle’s heart — his Corgi, Otis, who looks like a seasoned space tourist in his images, his tan and white face set in an almost stoic expression.